The title of Renee Locks’ 2018 wall calendar is from a poem by Mary Anne Radmacher entitled “Live with Intention” and reprinted with the author’s permission. 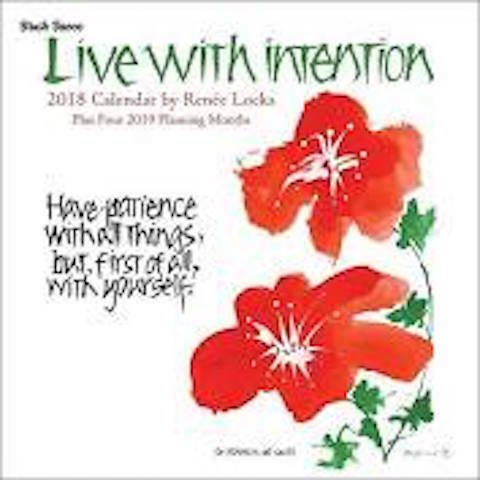 Many years ago I purchased a calendar by Renée Locks. Her art and calligraphy are breathtaking to me and the quotes she finds and uses are a perfect accompaniment to her art. 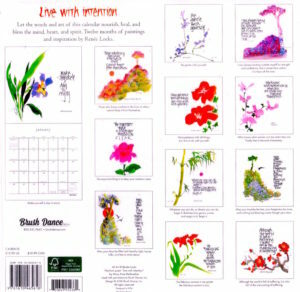 The name of her calendars, notebooks, journals, planner accessories, etc are called Brush Dance and her art does seem like her brushes are dancing! You can find all of her creations shipped free on: www.brushdance.com. The 2018 calendar cover says: Have patience with all things, but first of all, with yourself. The author is St. Francis deSales. This is a bird’s eye view of the back of the calendar cover to allow you to see the artwork inside. The computer cannot do justice to Renee’s work! And the quotes are wonderful. One by my favorite author, anonymous, sticks out: The fabulous woman in me greets the fabulous woman in you. Under the title on the back are these words: “Let the words and art of this calendar nourish, heal, and bless the mind, heart, and spirit. Twelve months of paintings and inspiration by Renée Locks. I can’t wait to hang mine up! 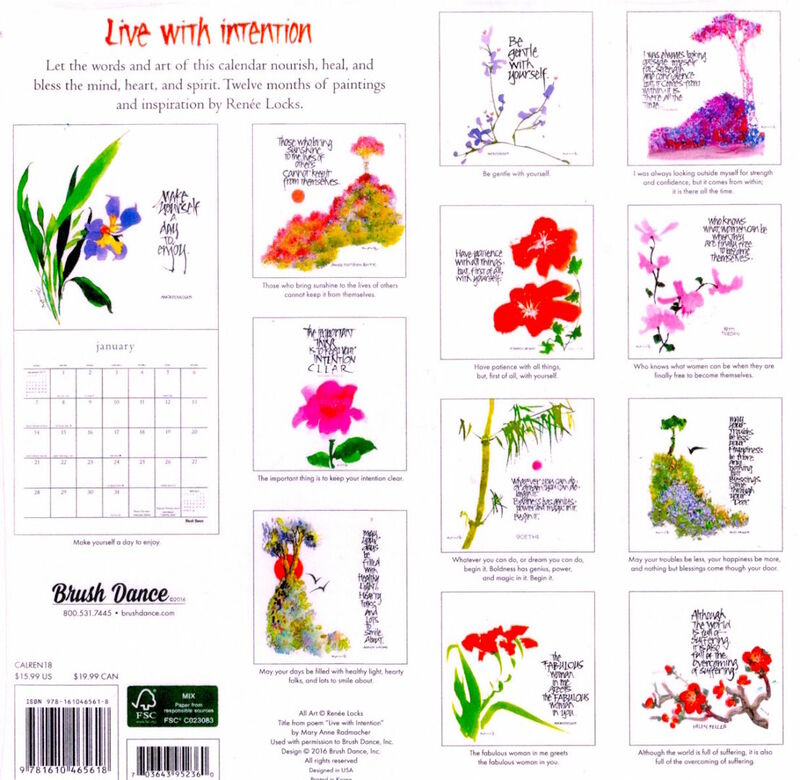 This beautiful 2018 calendar is available for $19.99 and can be found on Amazon, in stationery stores and directly from the website, www.brushdance.com. Makes a lovely end-of-year holiday gift! This entry was posted on Saturday, December 2nd, 2017 at 1:38 pm	and is filed under Home Page, Reviews. You can follow any responses to this entry through the RSS 2.0 feed. You can skip to the end and leave a response. Pinging is currently not allowed. I love this calendar and ordered it!!! !